Undecided voters and supporters of Libertarian candidate Robert Sarvis could play a very big role in who becomes Virginia's next governor, a new Quinnipiac University poll found. Democrat Terry McAuliffe carried the support of 46 percent of likely voters over Republican State Attorney General Ken Cuccinelli's 40 percent. 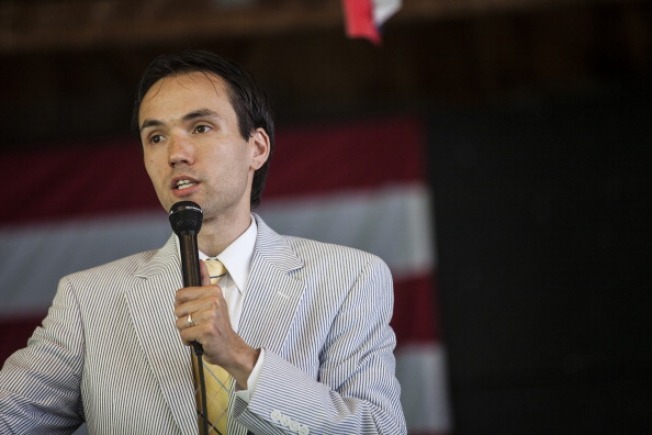 Eight percent of those surveyed planned to support Libertarian candidate Robert Sarvis. Last week, three polls gave contrasting views of the race for Virginia governor -- but like Monday's Quinnipiac University poll, they all showed that undecided voters and Sarvis could impact the closely-watched race's outcome. According to Monday's poll, five percent of those surveyed don't know who they're going to vote for while another five percent say they may change their mind by the time they arrive at the polls. If Sarvis wasn't in the race, McAuliffe's lead would widen from 46 percent to 49 percent and Cuccinelli would gain two points to his current 40 percent standing. “Libertarian Robert Sarvis continues to get almost one in 10 votes, apparently taking many of the Republican and independent votes Cuccinelli needs,” said Peter A. Brown, assistant director of the Quinnipiac University Polling Institute. “If Sarvis’ supporters stay with him in those numbers it is difficult to see where Cuccinelli can find enough votes to turn his fortunes around. The poll also found that 74 percent of those supporting Sarvis are doing so because they dislike McAuliffe and Cuccilnelli. “To make a comeback in the final hours Cuccinelli will need to take virtually all the undecided; peel off a few percent from Sarvis and hope that his turnout operation is superior to that of McAuliffe," Brown said in a Monday morning press released. Quinnipiac University surveyed 1,606 likely voters between October 29 to November 3. Monday, McAuliffe planned to campaign with Vice President Joe Biden while Cuccinelli hits the campaign trail with Republican Sen. Marco Rubio of Florida. The race is going to be decided by the few Virginians who choose to vote. The state Board of Elections chief says turnout could be as low as 30 percent of registered voters and the campaigns see 40 percent turnout as the goal.